The first white settlers here were Robert Hamilton Espy and Isaac Alonzo Clark. 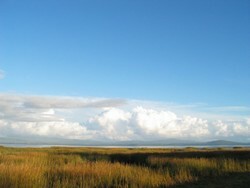 They had agreed on a rendezvous with Chief Klickeas who had told Espy of nearby tide lands covered with oysters. On April 20, 1854, as they paddled north from the head of the bay, they became engulfed by a heavy fog. Klickeas, having spotted them before the fog rolled in, guided them ashore by rhythmically pounding on a hollow log. The Indian Chief had not exaggerated; reef upon reef of tiny native oysters grew on the shallow bay bottom. Espy and Clark marketed the bivalves in gold-rich, oyster-hungry San Francisco. A peach basket filled with oysters brought a dollar in gold on delivery to a schooner anchored on the tide flats in front of town. That same basket brought $10 on arrival in San Francisco, and epicures in oyster bars and seafood restaurants there would pay a silver dollar for one oyster - an oyster smaller than the dollar! In no time, Oysterville became a rowdy, lusty boomtown. By 1855 its population and importance were such that it became the seat of Pacific County, Washington Territory. The town had many firsts - a school, college, newspaper, and finally, in 1872, a church - First Methodist. It is said that there were those in Oysterville who lived in "sin" and those who lived to be "saved" - about an even division. When the church was dedicated, the hard drinkers abandoned the saloons, marched in a body to the church, put their gold pieces in the collection plate, and returned to what they considered more stimulating than praying - drinking. Late in the 1880s fate took a hand: the long awaited railroad line ended at Nahcotta, an isolating four miles away; the native oysters became scarce and, without the possibility of a local livelihood, residents moved out en masse; finally, in 1893, the courthouse records were stolen by South Bend "raiders." Oysterville gradually became a sleepy little village where "time stood still." To see, in a small way, what Oysterville looked like in the old days, walk down Clay Street opposite the church to the edge of the bay and look back toward the village. You will see the fronts of the old homes which were built facing the bay. The street directly in front of the church, Territory Road, was once called 4th Street; Main Street was about where the easterly white picket fence is now; 1st Street was about where the easterly wire fence is near the bay; and Front Street has been consumed by the tide. 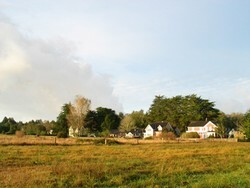 Oysterville is proud of its placement on the National Register of Historic Places in 1976. 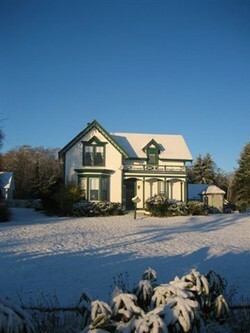 The Historic District encompasses about 80 acres of the village. Thanks to Sydney Stevens for this telling of "The Story of Oysterville."